We are here to assist anyone with a disability to get out and have fun and enjoy the freedom of being on the snow. Our experienced team will help with whatever you might need to be part of our wonderful alpine environment here in Zermatt. The program works to ensure there is virtually no limit as to who can participate in snow sports. With the right equipment and instruction anyone can enjoy the thrill of the mountains regardless of a disability. We are experienced and equipped to enable clients with a physical disability and/or learning difficulty to get out on the snow and learn to ski. Our adaptive team is headed up by Sarah Wilcock. 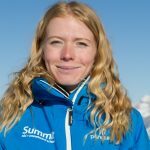 She has been involved with Adaptive Skiing for 14 years and has worked closely with the charity Disability Snowsports UK for a number of these years. Sarah has taught Adaptive skiing in Andorra, Italy, Austria, Canada, Australia of course here in Switzerland. Sarah spends the summers in England, working as an Occupational Therapist and has extensive experience in working with adults and children with a wide range of disabilities and conditions. Our adaptive instructors are trained to teach and deal with all disabilities and conditions. Our small team is extremely experienced and will be able to help you achieve your goals, whether you are getting on skis for the first time or are more experienced athletes who would like to compete. We can work with any disability at any level. Whether you need a mono ski or you have a child with autism we have the equipment and the instructors ready to help you enjoy your time on the snow. If you are unsure as to what you need or just have some questions regarding skiing with your disability then get in touch and we will be able to recommend exactly what you need. The equipment available is designed to enable everyone to participate in snow sports regardless of their abilities. Every skier who comes through the programme will be assessed before heading onto the snow so we can use the equipment and progression that is most relevant. Providing information in advance, through our booking form, about you and your disability, will enable us to advise on the correct equipment for your skiing experience, create a safe skiing environment, and make the most of your time here in Zermatt. On arrival in Zermatt your instructor will meet you to finalise the equipment and progression choices. Zermatt is a great place for disabled skiers to get out on the snow and have some fun. The equipment you require may determine where your skiing experience starts. Sit ski lessons tend to start at Trockener Steg, at the top of the Matterhorn Express lift. The long and wide blue and red runs in this area provide an ideal environment for the progression required to learn to ski in a sit ski. Lessons for clients with vision impairments, learning difficulties or who may use our three-track and four-track equipment will tend to start in the Sunnegga area. The large beginners area here, The Wolli Park, provides a safe and fun place to learn new skills. Experienced skiers will start on terrain that best suits their skiing needs. This could be at Sunnegga, Gornergrat, Trockener Steg or may even skiing over to Cervinia, into Italy. Zermatt has two main airports, Geneva and Zurich, that are easily assessable by the fantastic Swiss train network. The train takes you into the heart of Zermatt from both airports, where electrical taxis take you to your accommodation. All the trains are wheelchair accessible. Both Supermarkets in town have disabled access. One is located just over the road from the train station and the other is right by the ice rink, just off the main street. Meeting points can be decided with your instructor when you arrive. They can also let you know the best place to leave the ski equipment for the next day and how to get to and from your accommodation. Click here and choose disabled ski lessons when you complete the form. The office team will respond and put you in touch with Sarah, our head disabled ski instructor, so she can discuss all your requirements before you get onto the snow.